Wow! So um...apparently I'm not the only thrifty chick trying to reuse and empty Yankee Candle jars. The response to my original post on how to empty the candle jars was (and continues to be) overwhelming. Many of you left tips, tricks, suggestions and even warnings of your own. The one suggestion I heard over and over again was to stick the Yankee Candle Jar - with the last bit of wax - in the freezer for a few hours and the wax would easily pop out in one chunk. Well, why didn't anyone tell me? Here I am cutting the wax into pie pieces with a knife to remove it. So I tried the popular freezer method and here's my take - it definitely worked, but...yes, there's a but. After about 3 hours in the freezer, the wax at the bottom of the jar was easily able to pop off the bottom of the candle jar in one piece with a little nudge of a butter knife. The problem is many Yankee Candle jars are larger at the bottom than they are at the top. So while the wax pops off the bottom easily in one chunk it can't fit through the smaller opening at the top. I ended up breaking the wax up anyway. My feeling is it's six of one half dozen of the other - unless you have a jar that's the same diameter top to bottom then go with the freezer method. Several readers suggested putting the nearly empty Yankee Candle jar in the microwave to melt the remaining wax so it can simply be poured out. I do not suggest this. The bottom of the wick is attached to a small metal piece that I don't believe would be safe in the microwave. The theory to melt the remaining wax is good, however. In fact, what I didn't think to share originally is what I do with the last bits of melted wax. As I explained in the original post, as the candle melts down, I pour out the wax. It's actually possible to preserve the wax and continue to use it even without a wick. I pour the hot wax into a mini muffin pan and let it re-harden. Then I pop the wax 'muffins' out and use them in my Scentsy which heats the wax like a candle. This way I'm not wasting any bit of wax. At least one person inquired about what I do with the remaining hardened wax that I removed in the shape of pie pieces from the bottom of the Yankee Candle jar. Those pie shaped pieces can actually be used the same way as the wax muffins. They don't even need to be melted, just put them in a Scentsy or other wax melter and as they melt - which is pretty quickly - they will give off a fragrance like a candle. 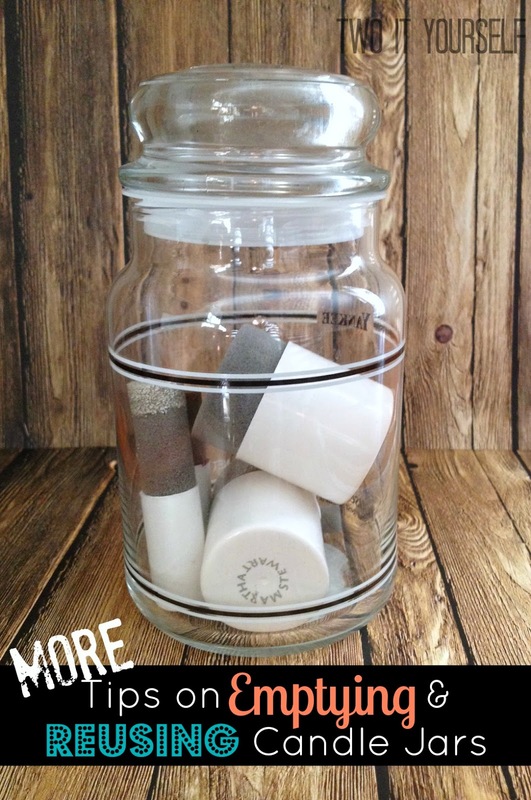 And just for kicks..here's another idea of how to re-use Yankee Candle jars. 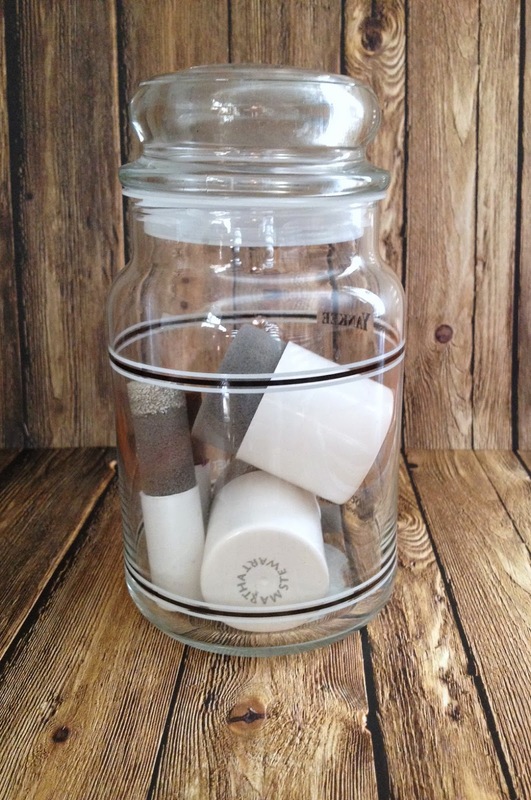 They make the perfect craft storage containers!